The effects of substituting Mg on the structural, magnetic, and magnetostrictive properties ofcobalt ferrite have been investigated. Comparable values of lattice parameter were obtained for the Mg-substituted samples. Saturation magnetization continuously decreased with increase inMg concentration. Peak-to-peak magnetostriction amplitude and strain sensitivity had a similar dependence on Mg concentration. 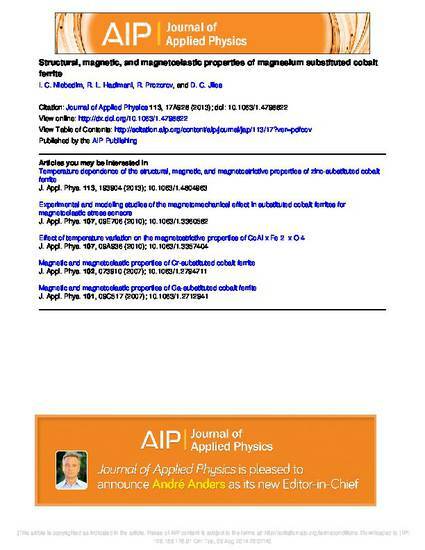 The following article appeared in Journal of Applied Physics 113 (2013): 17A928 and may be found at http://dx.doi.org/10.1063/1.4798822.